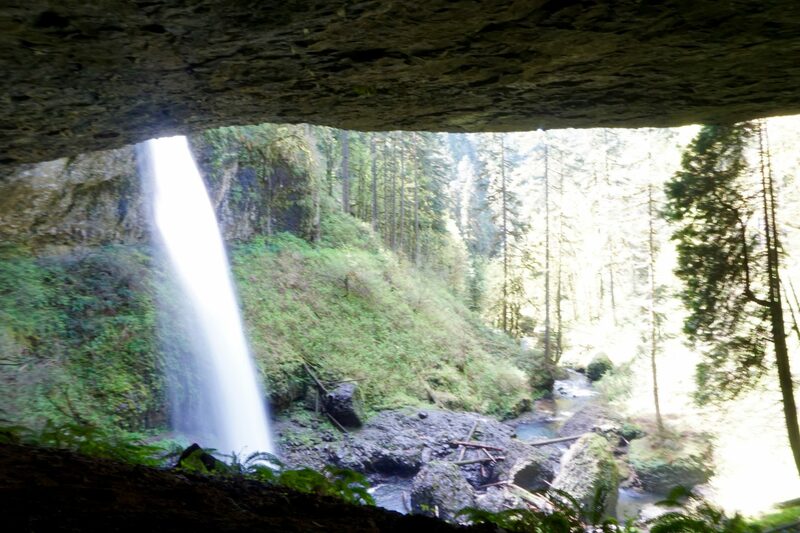 If you love waterfalls and nature, Silver Falls is the perfect place for you. With plenty of waterfalls, and forest-like scenery, it’s hard to imagine a prettier state park. 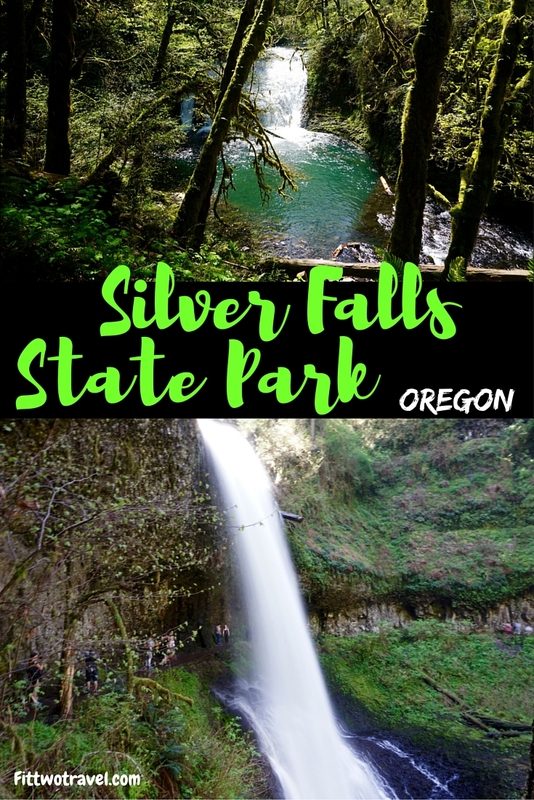 Honestly, I am disappointed in myself for making it all this time WITHOUT visiting Silver Falls State Park, as I have lived in Oregon my whole life! Silver Falls is the largest state park in Oregon, at 9200 acres. 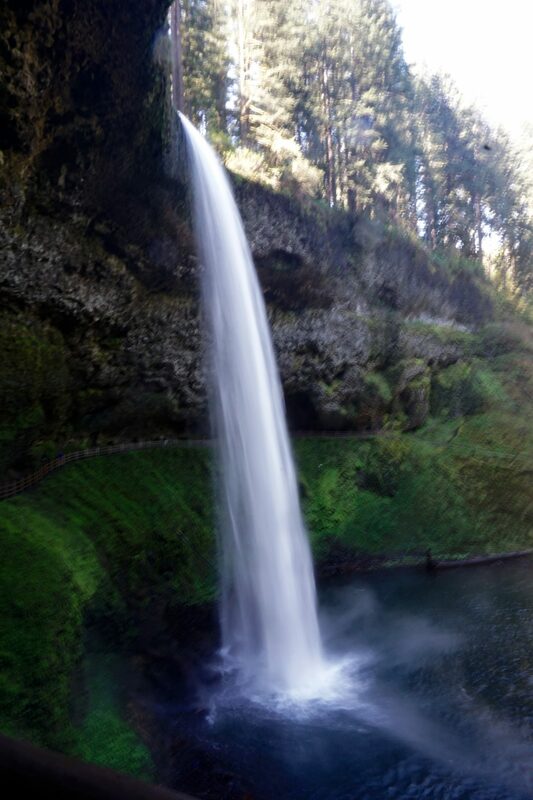 And now that we’ve visited Silver Falls in person, we think it has some of the best waterfalls that we’ve ever seen! This park is one of the prettiest places we’ve ever seen! If you come to Oregon, you must make a trip to Salem to see these falls for yourself! 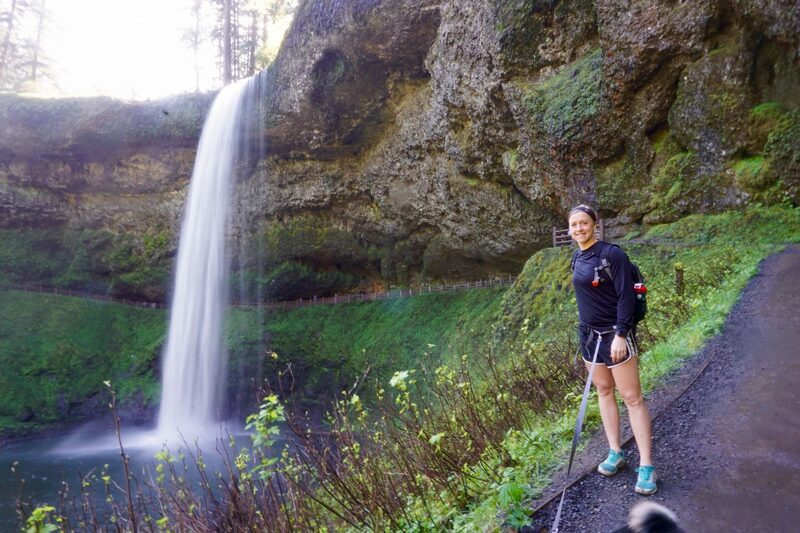 Like many places in Oregon, Silver Falls is a great place for a hike! There are many different hikes that you can do throughout the park. With lots of variety of distance, you can decide just how far you want to hike. It’s really easy to forget that you are actually hiking for a couple miles, when there are so many beautiful waterfalls and lush Oregon forests to distract you. We highly recommend the Trail of Ten Falls hike, as you can see 10 waterfalls along 7.2 miles. It’s a moderate hike, with an overall elevation change of under 1000 feet. The largest falls along this trail, the Double Falls, cascades from 178 feet high. It is just gorgeous! There are even a couple waterfalls that allow you to walk behind them and see the falls from a different view. If you only want to hike 5 miles, you can cut through at the Winter Trail back to the Rim Trail and back to the car. If you want to continue along, you will run into North Falls and Upper North Falls. For a detailed map of the Trail of Ten Falls, click here. South Falls is one of four waterfalls in Silver Falls State Park which features a trail passing behind the falls. Just like South Falls, the North Falls allows you to see the waterfall from behind the water, which is so awesome to experience! 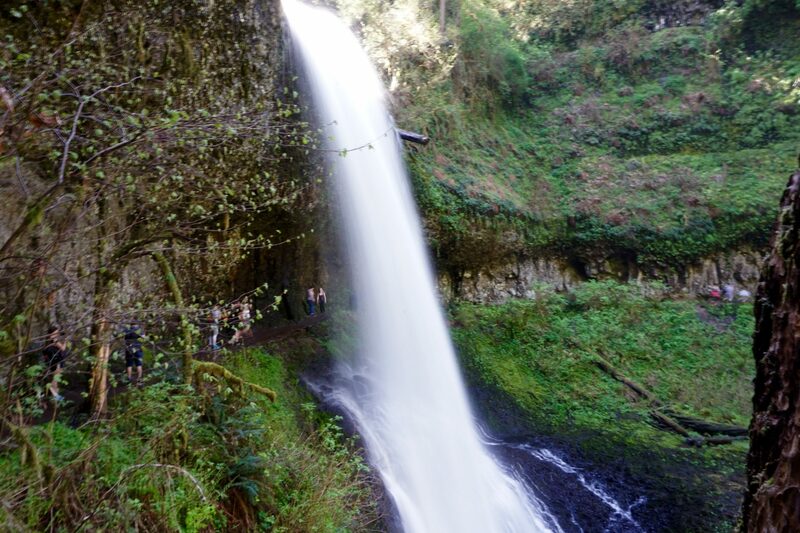 South Falls rates as one of the most photographed waterfalls in Oregon, along with Multnomah Falls and Punchbowl Falls, as you can see why in the photographs! We recommend starting at the bigger of the two lots: the South Falls entrance. Pay the entrance fee here and use the restroom before you start along the trail. It’s also closer to the lodge, where you can enjoy some food and drinks when you are done. Not long after you start along the trail, you will hear South Falls! Once you arrive at the falls it is truly incredible to see! Fun fact: The Hunted (2003), and the blockbuster film Twilight (2008) have both been filmed in Silver Falls. Tourist attraction: This is a popular hike, so if you are coming in the summer or on the weekend, prepare for a lot of people. Come early before it gets too busy! 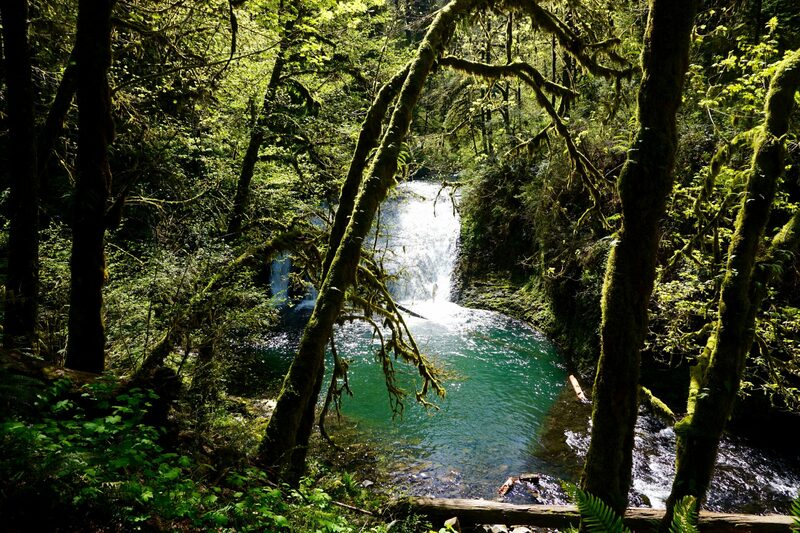 If you love waterfalls and some gorgeous tree scenery, make a trip to Silver Falls. You won’t regret it once you are there! What are some of the prettiest waterfalls you have ever seen? Lovely pictures. Seems like a wonderful trek. It looks like a beautiful place to hike! I lived in Oregon for six years and never made it to Silver Falls! I love that you can walk behind some of the falls too. Great pictures. Inspiring. Wow that is a huge park! How long did you guys spend there? I’ve never been to the Pacific Northwest, but you make it look beautiful. I really need to make it out there one day. Such a unique landscape. Just added this to places to visit in Oregon after the Crater Lake. This waterfall reminds me of the waterfalls in Iceland. It looks like an amazing hike and a lot of fun. I’ve never heard of this park before and now want to go! I’ve hiked to Tunnel Falls outside Portland and that was pretty spectacular. Thanks for sharing! There are so many great places parks, waterfalls and more to see in so many provinces and states. It’s the best form of short term travel in my opinion. 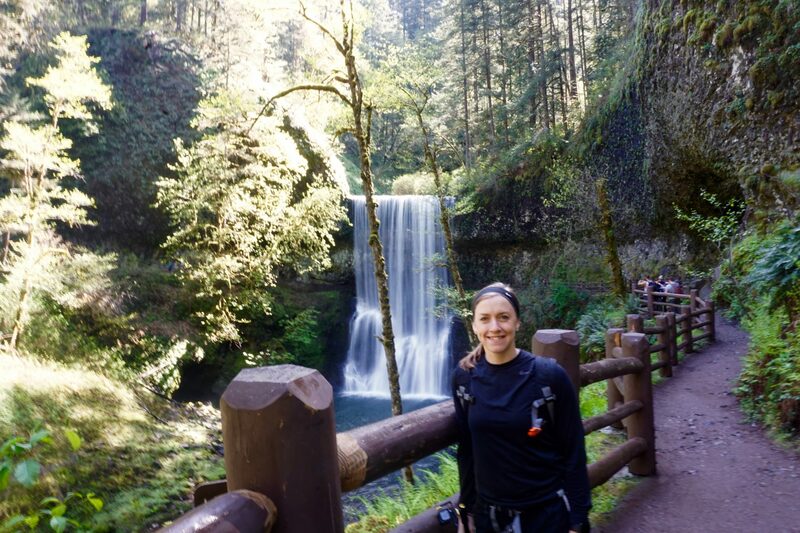 I lived in Portland for five years and one of my favorite things about Oregon were the amazing hikes and waterfalls! Don’t think I ever made it to Silver Falls though. Great find. This is a great reminded for me, as I haven’t been here in 25 years or so. 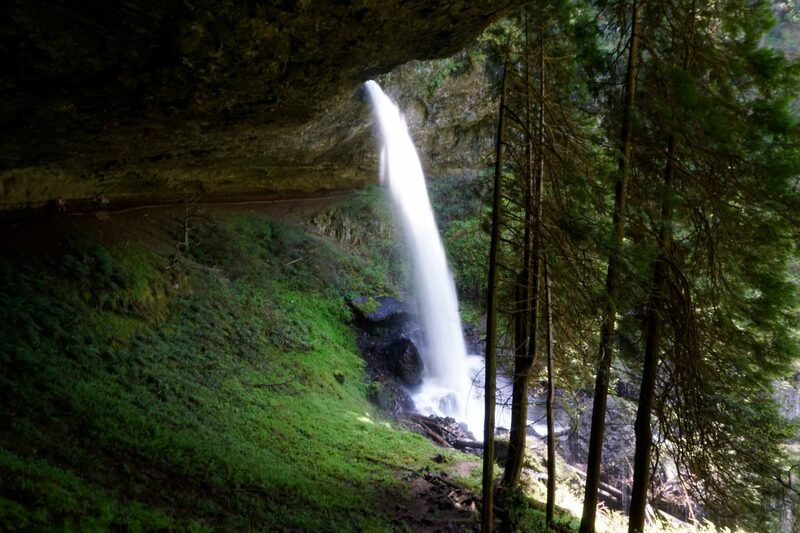 I love Silver Falls and now need to research some camping here. So cool!! Beautiful park! That waterfall is incredible. It’s so cool to be able to walk behind a falls! What a beautiful hike! My kids love waterfalls and can happily be lured along with the promise of a waterfall (or 10). These falls are seriously beautiful! It’s amazing that this beauty is right in your backyard so to speak! Looks like some amazing hiking. Never been to Oregon but may have to put it on my list to see if it looks like this. Such a epic waterfall! Could spend the day exploring and admiring the view! I looks lovely. Very interesting they filmed a couple of movies there! We love waterfalls and these are stupendous. Lovely place, could stay there forever, listening to the roar of the water as it cascades down. The waterfall looks absolutely great. It seems like a great hiking tour. I love the place for the fact that you can go behind the waterfalls. Some of your pictures are just amazing. Thanks for sharing this. 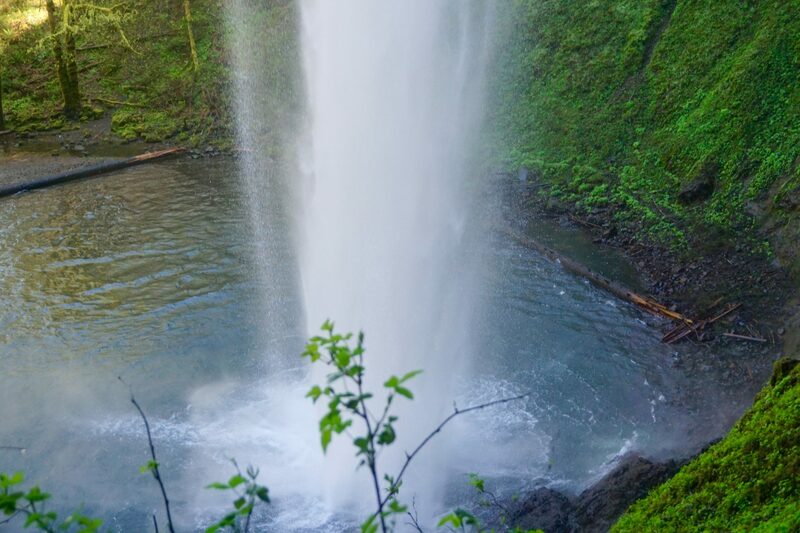 Wow, those are some beautiful falls, and not ones as a Brit I’ve ever encountered in pictures or literature like the aforementioned Multnomah… Oregon is high on my list of states I’d like to visit soon. I’m regularly over in the states as I have friends living in Texas, Oklahoma and New Mexico, but a trip to Oregon may just have to elbow one of those trips out the way, lol…. Most impressive waterfall walk in England is the Ingleton Waterfalls trail – a 4.5mile route with some 18 falls. Worth checking out – I’ll certainly be blogging about those soon! 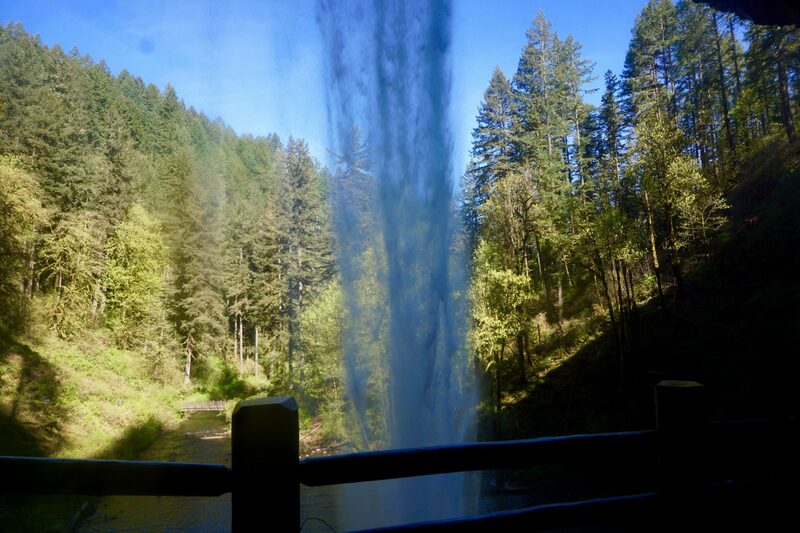 If you visited Silver Falls you probably passed right by my house! We love going there throughout the year. Summer for the trails across the street from the falls where we can ride our horses on a beautiful 7 mile loop. The huckleberries up there at the end of summer are the best! Winter at the main lodge is very festive with the colorful lights shinning on the snow and the small Christmas Market they have had the past few years. Love the photos! This is yet another place I need to visit.